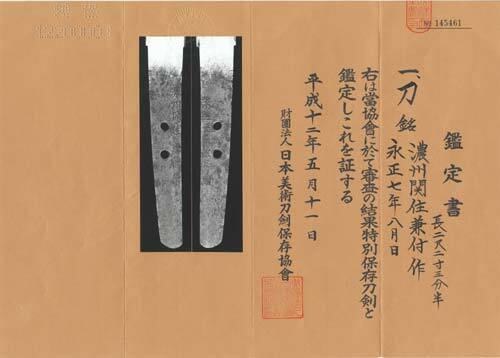 This elegant Katana comes with an NBTHK Tokubetsu Hozon paper attesting to its authenticity and quality. Sugata(configuration) : Shinogi-zukuri, Iori-mune. Deep in curvature with upper pointed indication leading to a middle tip so called Tachi style which is elegant and awe-inspiring. Kitae(forging pattern) : Kitae-hada is itame hada which is conspicuous and covered with Ji-nie hard metal granule. Shinogiji shows Masame straignt grain mark. Hamon(tempering pattern) : Hamon is faint Ko-Nie based starting with straight temper line with subtle small gunome so called YAKIDASHI and then gunome zigzag, small clove outline, sharped Togari-ha shape in which interior is active with feet and Sunagashi bruising lines works delicately. Boshi (tip): The temper of the tip in front is waves irregularly into KOMARU small circle with hakikake bruishing up indication then turns back deeply connecting to a Muneyaki (temper on back ridge) and reversed side irregular, small circle turns back that connects with Muneyaki as well. Nakago(tang) : UBU un-altered, V-shape (Takanoha) filemarks and Ha-agari Round heel shape. The signature in hakiomote is located shinogiji side, long character that reads Noshu Seki-ju (location), KANETOMO saku (smith name) and Ura side is chiselled the date of year the Eighth month, Seventh year of Eisho (A.D.1510). The subject katana is one of the most superb works in an excellent condition of the smith KANETOMO or (KANEMASU in different pronuciation). The date of year he Eighth month, Seventh year of Eisho (A.D.1510) deserves special mention among all Mino works. From the sword smith directry, smith KANETOMOs three generations had been active from Eisho to Keicho ERA 16 th C. However it is quire rare to come across his works especailly a work with date of year and location, which increases scarcity and historical value. The entire blade holds an elegant tachi style and it's guessed the reason why the blade has been preserved and maintained carefully almost 500 years. Another highlight is it's complete set of mounting Hemp-palm, blue pearl of inlay lacquered sheath handachi style Koshirae that consists of Shakudo ground wave pattern surface with plovers motif - All matching Fuchi/kashira, Koikuchi, Kurikata, kashiwaba and Kojiri all in complete - Takabori, gold and copper Iroe inlay. The menuki is KIRI crest, silver Yobori. Tsuba is Iron polished surface, plovers are shakudo and Suaka Iroe inlayed and both hitsu-ana edges are silver Iroe inlay. 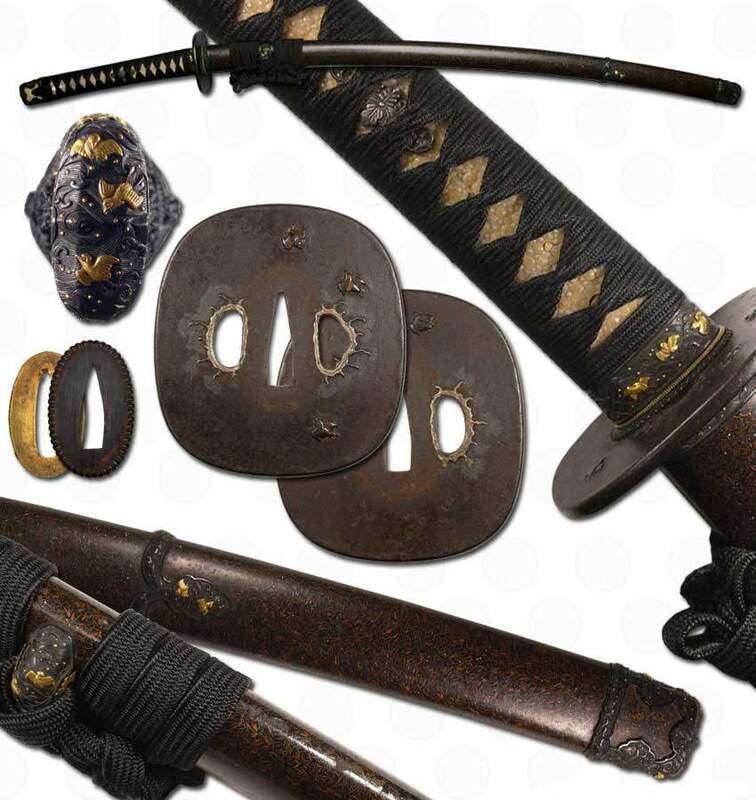 Set of both Katana and Koshirae shows superb workmanship and is in exellent condition. Gold foil habaki collar, set in Shira-Saya plain wood mounting.